How do I choose settings when running a tool? Spades is one of a number of de novo assemblers that use short read sets as input (e.g. Illumina Reads), and the assembly method is based on de Bruijn graphs. For information about Spades see this link. The read set for today is from an imaginary Staphylococcus aureus bacterium with a miniature genome. The whole genome shotgun method used to sequence our mutant strain read set was produced on an Illumina DNA sequencing instrument. The files we need for assembly are the mutant_R1.fastq and mutant_R2.fastq. Each read is 150 bases long. The number of bases sequenced is equivalent to 19x the genome sequence of the wildtype strain. (Read coverage 19x - rather low!). Click on Galaxy Australia Training Material: Assembly: Microbial Asssembly. Tick the boxes next to the two files. You should now have two files in your current history. We now have two FASTQ read files in our history. Click on the eye icon next to one of the FASTQ sequence files. View the file in the centre Galaxy panel. Go to the Tool panel and search for “spades” in the search box. In this case, most of the default settings are appropriate for our data set and analysis. 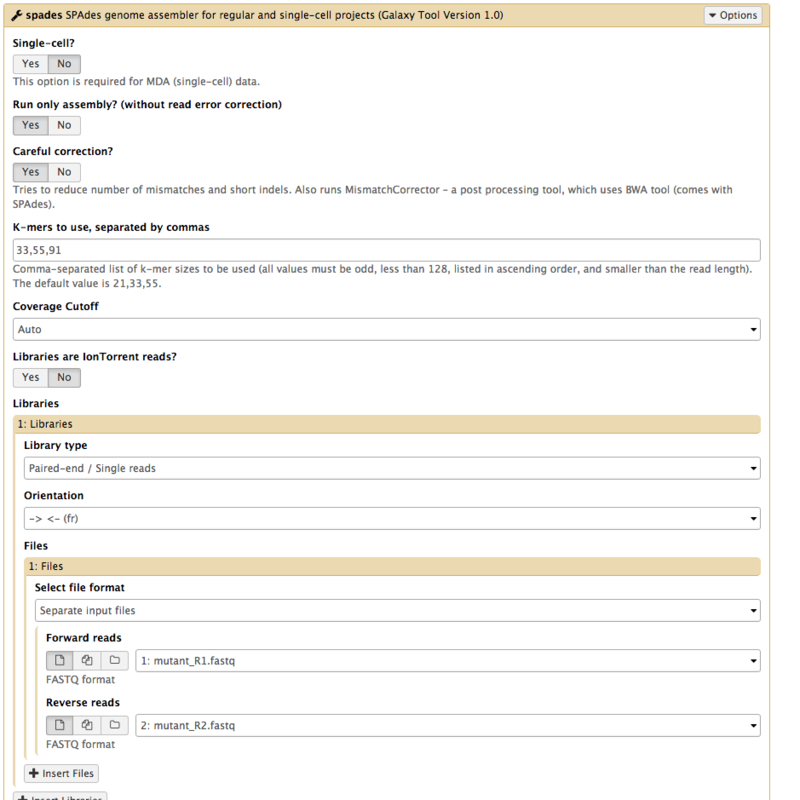 Under the tool interface in Galaxy there will usually be a more detailed description of the tool options, and a link to the tool’s documentation. It is recommended that you read about the tool parameters in more detail in the documentation, and adjust to your data and analysis accordingly. Galaxy is now running Spades on the reads for you. 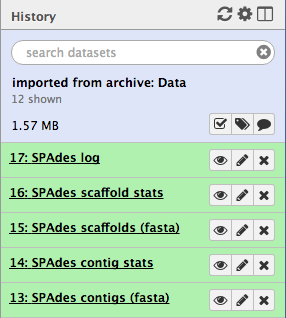 To view the output, click on the eye icon next to each of the files. Note that the short reads have been assembled into much longer contigs. Look at the contigs.stats file. Find a contig that seems to have high coverage relative to the other contigs. Extract this sequence from the contigs.fasta file. Select the sequence for the contig (called a Node) of interest, and copy. Go to the NCBI page and BLAST this sequence to see what it matches. Try the “blastx” option, which will translate your nucleotide sequence into a protein sequence. For Enter Query Sequence, paste your sequence into the box. For Genetic Code choose “Bacteria and Archaea”. For Database, try the “SwissProt” database. You can also re-try with other options to see how the database affects the results. All other options can be left as default. Click BLAST. What does your sequence match? Does this suggest that the sequence is a repeat region in this bacterial genome? For a detailed description of the output, see the top right corner of the page and click “Blast report description”. Here are some references covering more information about genome assembly. More about de Bruijn graphs: Compeau PEC, Pevzner PA, Tesler G. How to apply de Bruijn graphs to genome assembly. Nat Biotechnol. 2011 Nov 8;29(11):987–91. An assembler for long reads: Koren S, Walenz BP, Berlin K, Miller JR, Phillippy AM. Canu: scalable and accurate long-read assembly via adaptive k-mer weighting and repeat separation Genome Res. 2017 May;27(5):722-736. An assembler for large genomes: Jackman SD, Vandervalk BP, Mohamadi H, Chu J, Yeo S, Hammond SA, Jahesh G, Khan H, Coombe L, Warren RL, Birol I. ABySS 2.0: resource-efficient assembly of large genomes using a Bloom filter. Genome Res. 2017 May;27(5):768–77. Visualizing genome assemblies: Wick RR, Schultz MB, Zobel J, Holt KE. Bandage: interactive visualization of de novo genome assemblies. Bioinformatics. 2015 Oct 15;31(20):3350–2. Yeast genome assembly: Goodwin S, Gurtowski J, Ethe-Sayers S, Deshpande P, Schatz MC, McCombie WR. Oxford Nanopore sequencing, hybrid error correction, and de novo assembly of a eukaryotic genome. Genome Res. 2015 Nov;25(11):1750–6. Animal genome assembly: Austin CM, Tan MH, Harrisson KA, Lee YP, Croft LJ, Sunnucks P, Pavlova A, Gan HM. De novo genome assembly and annotation of Australia’s largest freshwater fish, the Murray cod (Maccullochella peelii), from Illumina and Nanopore sequencing read. Gigascience. 2017 Aug 1;6(8):1–6. Human genome assembly: Chaisson MJP, Wilson RK, Eichler EE. Genetic variation and the de novo assembly of human genomes. Nat Rev Genet. 2015 Nov;16(11):627–40. Plant genome assembly: Jiao W-B, Schneeberger K. The impact of third generation genomic technologies on plant genome assembly. Curr Opin Plant Biol. 2017 Apr;36:64–70.